API technology has become an integral part of Fintech, together offering future-proof solutions for the entire finance industry. Since the year 2000, when web APIs first appeared with the introduction of Salesforce, the technology has been waiting for its perfect match. It roamed the internet connecting with innovative technology and intelligent verticals. Then, one day, it met Fintech, and its world hasn’t been the same ever since. APIs forever changed the way payments happen. API technology has become part of the digital revolution and could go hand in hand forever with its beloved Fintech and transfer funds, provide the details of monthly spends, or discover the best premium for vehicle insurance. API tech is so happy to have found the perfect match. Fintech and APIs – a match made in heaven! If Fintech and APIs were real people, this story could have been a Hollywood romance flick running for weeks in cinemas near you. But if one looks beyond the pretty packaging of the UI/UX, at the back-end level, this exact story plays out everytime a new API is designed and developed for a Fintech product. Haven’t you analyzed your financial portfolio through a third-party app at least once? Aren’t you looking for best deals to grab for a weekend movie? When you’re out having dinner at a restaurant with friends, don’t you use an app to split your bill? If you answered ‘yes’ to even one of the questions above, you are part of the Fintech-API family. APIs are assisting banks in integrating banking data with investment and bookkeeping software to provide quick internal access to a wide variety of account information. APIs can be imagined as a box of code that can perform a certain action and provide results to an interface, provided it has a predefined set of inputs. Now imagine a marketplace with hundreds of boxes floating around. While one box can help you discover the best deals, another can help you sign up for an insurance policy. As a user, you don’t have to open and use all the available boxes. Just choose the ones you like and disregard the others. So API-led innovation is helping the customer choose the kind of service they need rather than opting for an overloaded all-in-one package. When PSD2 came into force in January 2018, it added openness to APIs, empowering the customer to receive more enriched, data-driven, and controlled results. Traditionally, banks would be hesitant to share any data with any third-party fintech firms. With PSD2 the data sharing power went to the customer, thereby pushing Fintech firms to come up with more innovative solutions and offers. According to a report by goMedici, there has been an explosion in the number of new FinTech/FinServ APIs added since 2017, as compared to 2014-2017. 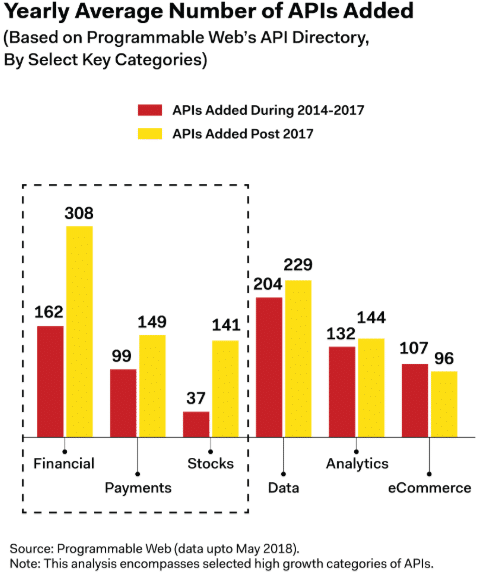 Financial APIs have seen a remarkable growth post-2017, joined by APIs for payments and stocks. Other supporting verticals of Fintech like analytics, e-commerce, and data have also seen amazing growth in that time. This remarkable rise is indisputable proof of the growing demand and need of banking as a service. Not only do APIs help with customer engagement and increasing digital revenue, but they also offer banks with future-proof technologies ensuring agility and speed. Through transforming banking into a platform business model fintech can expose banks to existing and new functionalities to participate in the market, embed their position within the value chain to build upon the traditional customer-bank relationship, and maintain their share in the market. This blog was originally published at Fintech and APIs – A Match Made in Heaven?